Loyalty! X regiment, X Troop, X Platoon, X Squad, this is Trainee no. 54 Shim Changmin. Have you been well? I've been doing very well. While I've been close with the squad and platoon members in this place, I've been also eating well like crazy just like my original appetite! Even if the way I talk is stiff, you still understand! Originally, the soldiers talk in a more soldier-ish cool way. I'm working hard because I also want to talk cooly like that. Above all! To the fans who will cheer me for 1 year and 9 months starting from the day of my enlistment, thank you so much. And... Uhmm... I'm resenting the quiet people during my enlistment day-- These are not the right words. Just what.... Haha... I would limit my words to my acquaintances... First, my beloved family, my beloved company members! Uhmm... Well! It's now important from here. Just... 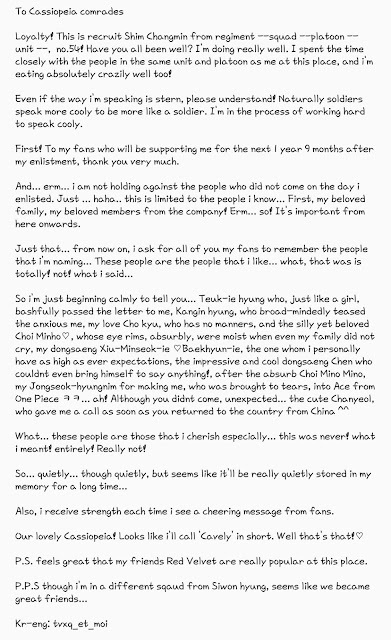 Remember, my fans, the people whom I will call (t/n: write/mention) from now... These people are good people... What, it's ab!so!lute!ly not a talk like that... Just please understand my quiet babbling... Teuk-ie hyung who shyly folded his letter as if he's a girl, Kangin-hyung who teases broadly the impatient me, my love Cho Kyu who has no manners, my family also who didn't cry, but did their best to control it even if their eyes were ridiculously moist, our pathetic but lovely Choi Minho, my younger brother Xiuminseok-ie♡ who is stingy♡, Baekhyun-ie whose expectation personally is very, very, very, very big (t/n: big as in exceeding the normal level), the very lovely younger brother Chen who gave an impression even though he came and didn't say anything!, in the next place is the ridiculous Choi MinoMino. Nae JongSeok (gym trainer) hyungnim who made into One Piece's Ace the me who was moved to tearsㅋㅋ… Ah! He didn't come, due to an unexpected incident... but called me as soon as he returned from China, the cute Chanyori (EXO's Chanyeol)^^ What... these people are particularly special to me... What. The meaning is never! absolutely! completely! really not like that!! And I gain strength every time I see everyone's support messages. P.S I feel so proud because our Red Velvet is really popular in this place.